After arriving at Phnom Penh airport (which has a frightening display of uniforms and brass), I was picked up by a driver who was employed by our hotel. A good-natured bright young man, he immediately informed me that he wanted to practice his English on our journey. That was fine, given my Khmer is almost non-existent so we chatted as he weaved in and out of the flocks of scooters drifting up and down Phnom Penh's boulevards. His economic future, he told me, was in mastering English and becoming a translator. This belief is widespread: and there is some reality to it. Cambodians do spend many hard hours studying and learning English. For sure, in a city populated by Anglophone well-wishers, do-gooders and business folk, translators are in demand. Apart from the sheer effort it takes to learn another language (and given Cambodia was a French colony, English is not a "natural" part of the country's history), translation is an extraordinary art. In the ideal world of objective truth and pure facts, some claim that translators must be fully transparent, a neutral cipher, merely delivering up the question uttered. Translators according to this view must have no opinion and no impact on the scene before them – be it a business transaction or an interview. The reality of course is so different. Translation is always "imperfect" – words are never identical from language to language, and bring along with them culture, history, beliefs and world-views. And the translators are of course people whose identities are constructed through their language and their history. Cambodia's traumatic past is never far away, framing, filtering and shaping their understanding. I decided early on as a director to include my translators as characters, given the crucial role they play, their own dramatic and painful histories and my admiration (given my own limited skills) of the linguistic abilities they display. 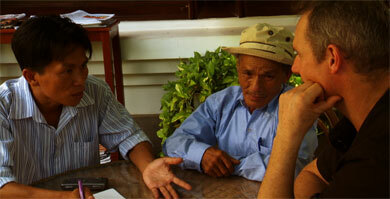 Filming the process of translation also reveals much about documentary filmmaking. Translation slows and staggers the flow of information, revealing the mechanics of communication, miscommunication, comprehension, misunderstanding and cultural difference. A rhythm is established that we settle into. In Brother Number One, the triumvirate of the translator, Rob, and a subject (sometimes a victim, other times a perpetrator), are all on screen. We see the translator ask the question we, Rob or I, pose. The answer cannot be too long as the translator must absorb the answer, mentally interpret it and relay its content. At times, the translator will ask in Khmer for clarification and a mini-interview, inaccessible to all of us Westerners, will ensue. Throughout this process, Rob scans the faces, reads body language, without understanding the words, keen for information. The roles then switch, with the subject watching Rob's response to his or her answer - at times with apprehension. Time is slowed and waves of emotion, anger, and sorrow can hang suspended, breaking slowly. Translators can become overwhelmed with empathy for Rob, or, as often their own sorrow or anger rises to the surface. They can become too emotional to continue, or they interject with their own questions, their buried pain rising to the surface. I see them too frequently soften content so that the blows fall off Rob more lightly – they feel compelled to relay answers but also know that they will hurt. While I watch, it makes me reflect on the power, still, of the Anglophone speaker. Despite the world being in a "post-colonial" age, English, known as the "business language" appears to rule. In a country like Cambodia, deeply impoverished but with some real entrepreneurial spirit, the ambitious buckle down with English dictionaries painstakingly teaching themselves English word by word, so they can help those (yes, filmmakers, aid workers, businesspeople) that ironically are supposedly there to help them. I kept thinking, if that effort could be directed elsewhere: to their own professional development, to the acquisition of practical skills needed by their own people, perhaps, we the "helpers" would be less needed. The BNO team offer our heartfelt condolences to those who have lost family and love ones in the incident. Our thoughts are with you. Rob talks about his experience testifying in the trial of Comrade Duch in Cambodia. Hi Rob here. Sorry I haven't written anything for nearly a year! To those who have written comments that have gone unresponded it is not because I'm ignoring them. It's simply that I haven't seen them. The settings on my personal account seem to stop me getting alerts. I am on the case to try and rectify this. Any...way, just thought that anyone who happens to be in Christchurch on the afternoon of 22 October (that's next week) might be able get tickets (which I think are free) to TEDx. I will be doing a presentation telling the story and discussing the issues around it. Kiwi rower Rob Hamill will return to Cambodia at the end of July to hear the verdict in the trial of Comrade Duch, the Khmer Rouge commander of Tuol Sleng prison where Rob’s brother, Kerry, was tortured and killed in late 1978. Rob’s presence at the Extraordinary Chamber of the Courts of Cambodia (ECCC) for the verdict on the 26th July comes almost a year after he testified there as a ‘Civil Party’ representative. Speaking as one of many that suffered losses at the hands of the Khmer Rouge, Rob gave testimony exactly 31 years after Kerry and Englishman John Dewhirst were snatched from their storm-blown yacht. A third sailor Canadian Stuart Glass was killed on the spot. Kerry and John were tortured for up to two months at ‘Tuol Sleng’ (also known as ‘S21’) and forced to falsely confess they were CIA spies, before being executed on the orders of Pol Pot. 14,000 Cambodians met a similar fate at the prison. Rob’s statement, like that of the other Civil Parties, was intended to influence the sentencing of Duch. Rob’s story is the subject of ‘Brother Number One’, a film produced by Annie Goldson, James Bellamy and Rob for BNO Productions/Pan Pacific Films. The documentary is intended for theatrical and broadcast release in New Zealand and worldwide, and is funded by NZ on Air, TV3, and the NZ Film Commission. Annie, an Associate Professor at the University of Auckland who has received multiple awards for her earlier films, is also directing, with Academy Award-winner Peter Gilbert and Kiwi Jake Bryant sharing the cinematographer credit. See www.brothernumberone.co.nz for further information. The Extraordinary Chamber of the Courts of Cambodia is under joint Cambodian and UN jurisdiction. Former New Zealand Governor-General Dame Silvia Cartwright is one the two international judges who, along with three Cambodian judges, will decide Duch’s fate. See http://www.eccc.gov.kh/english/ for more info. Rob Hamill is widely known for winning the first-ever Trans-Atlantic Rowing Race in 1997 with the late Phil Stubbs. He currently works as a motivational speaker, as an organiser of ‘The Great Race’ international rowing event on the Waikato River. He has also been elected to the WEL Energy Trust and campaigns for environmental causes. Please direct all enquiries to the following contacts: they will liaise with Rob if you need additional information. “Brother Number One” was the name that Pol Pot, the leader of the genocidal Khmer Rouge regime of Cambodia, gave himself. Kerry Hamill was also “brother number one” the oldest boy in the large Hamill family of Whakatane, New Zealand. In 1978, the lives of the two “brother number ones” collided. Kerry Hamill was on board his charter yacht Foxy Lady with two other men when they anchored at Koh Tang Island to shelter from a storm. Unbeknownst to them they had entered Kampuchean waters, neither did they know of the horror story that was unfolding on the mainland. They had sailed from the hippie era of “love and freedom” into Year Zero. Along with Englishman John Dewhirst, Kerry was seized and tortured for two months at the Khmer Rouge slaughter house, Tuol Sleng (S21). After signing confessions that “admitted” CIA affiliations, they were executed on Pol Pot’s orders. A third companion Canadian Stuart Glass was shot and killed when the boat was captured. Some would say he was the lucky one. Our documentary Brother Number One follows Kerry’s younger brother Rob Hamill, an Olympic and Trans-Atlantic rowing champion, as he travels to Cambodia. Rob will attempt to discover the most probable scenario surrounding the capture, incarceration, and murders of his brother and sailing companions. He will travel with Cambodian translator Chantou, a survivor of the killing fields who will tell her story in parallel with Rob’s. Together they will explore the devastating impact of Pol Pot’s maniacal ideology—which saw 2 million killed through execution, starvation and sheer hard work. The film will interweave the history of Cambodia with their journey. The former French colony was sucked into the Cold War; bombed illegally by Nixon and Kissinger; suffered four years of Khmer Rouge brutality; was invaded by the Vietnamese; then in a twist of realpolitik, saw the greatest war criminals since the Third Reich aided and abetted by China, the US and the Western powers. Many Cambodians today remain ignorant of their history, their lives marked by poverty, HIV, and violence. Rob’s journey will culminate in a confrontation in court with Kaing Khek Iav, better known as Comrade Duch, former Commander at S-21, who gave the final orders for Kerry and John to be tortured and killed. Up to 14,000 Cambodians met the same end in the notorious prison. After 30 years of impunity, Duch and four former “Brothers” are currently standing trial for Crimes Against Humanity, homicide and torture in the Extraordinary Court of Cambodia, a war crimes tribunal that was finally established this year after a decade of international wrangling. The film will be directed by award-winning filmmaker Annie Goldson (Punitive Damage, Georgie Girl, An Island Calling) and produced by Pan Pacific Films. Producer/Director: Annie Goldson is a filmmaker, whose award-winning feature documentaries – which include An Island Calling, Punitive Damage, Georgie Girl, Sheilas: 28 Years On, Pacific Solution and Elgar’s Enigma – have received over 30 awards internationally at film festivals. They have also been broadcast on most major channels, including HBO, PBS, ABC, SBS, Channel 4 (UK), ARD and others. An Island Calling (2008), funded by TV3/NZOA with an SBS presale, recently won Best Documentary and Achievement in Camera at the Qantas Film and Television Awards. Annie was also a finalist in the Achievement in Directing category. The documentary subsequently won Best Documentary and Best Director at the Madrid Lesgai International Film Festival, and the Grand Prix at FIFO, the Oceania Festival in Tahiti. The film premiered at Hotdocs in Toronto and screened at a number of international festivals including Sydney, Melbourne, FIPA, Seattle, Frameline and Newfest. She is also a writer and academic and received her PhD from the University of Auckland where she teaches in the Department of Film, Television and Media Studies. Annie received the New Zealand Order of Merit in 2007 as recognition for services to film. As well as working on Brother Number One, she has a science series Mismatch: Why our world no longer fits our bodies in development for international broadcast. Originating Producer: James Bellamy has worked in the film industry for over 24 years in a variety of roles, primarily as a documentary producer/director on award-winning documentary, arts and lifestyle series. He has completed three documentary features as an independent producer, which has involved him in extensive international production. He directed and produced Art in the Freezer to coincide with the 50th anniversary of Scott Base in Antarctica. The film was introduced on-air by Sir Edmund Hillary. Given this latter experience and his enthusiasm for longer-form documentary, James is now intending to dedicate himself to projects such as Brother Number One. Key Documentary Subject/Producer: Rob Hamill rowed for New Zealand for 16 years winning World Championship Silver and Commonwealth Gold. He holds a world record on the indoor rowing machine and competed at the Atlanta Olympics in 1996. Rob is also a writer, publishing The Naked Rower, an account of how he and Phil Stubbs won the first trans-Atlantic Rowing Race in 41 days. Since his ocean adventure Rob has often considered tracing the wake left by his brother Kerry to discover what really happened in Cambodia. That time has come.